The unique structure of the sliding surface SPORTFIX TB protects often very expensive ski equipment from damage and the special construction of the modules effectively stops the snow, what is significant in the areas with high snow comsuption. TB Mats allow to limit time and costs of snowing these problematic parts of ski resort. Surface modules effectively stops snowing, slow down the process of melting and blowing away, and in the case of lack of snow allows comfortably use the ski lifts. Invaluable on the densely wooded sections of ski routes due to canopy restricted falling snow on the route. Surfaces could be use as a base under artificial and natural snow. Winter animation with SPORTFIX surfaces. SPORTFIX mats are also used as a functional addition to the fabulous winter animation, most often used during Christmas and outdoor events. Shopping centers, exhibition areas in closed and outdoor areas. Our SPORTFIX surfaces have been used many times in film and television productions and advertising spots. In recent years, many ski slopes, make the new entertainment sensation – snow tubing. Now, thanks to SPORTFIX TB tubing track surfaces to enjoy this warm family form of relaxation, you do not have to wait until winter. Tubing, or in the winter version snow tubing, is relatively new form of active leisure time on the slopes, but already gaining huge popularity. 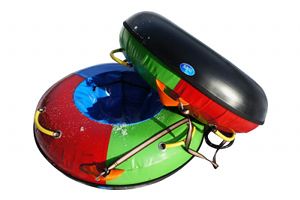 Tubing is nothing more like sliding down on the specially prepared track, in the winter covered with snow and in the absence of snow special surfaces made of plastic, sitting on large inflatable “dinghy”. Track to tubing, consisting of profiled corners and straight sections limited by the bands, is designed not only to provide the sliding surface, but also for the safety of users, preventing them from going off the route in more dangerous terrain. Refined design of SPORTFIX surface, providing maximum limit of frictional resistance between the “dinghy” and the track surface, giving the amazing impression of speed. Tubing track is a great entertainment for both children and adults, now thanks to SPORTFIX surfaces available throughout the year.